The National Association of Vehicle Inspection Centres of Portugal (ANCIA) has celebrated its National Convention on June 18th, 2015 in Cascais, Portugal, with the theme “Quality of Inspections in Road Safety”. 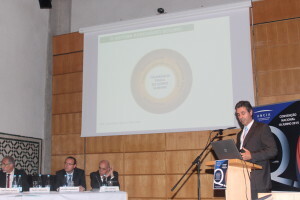 The Convention had the attendance of local authorities: Autoridade Nacional de Segurança Rodoviária (ANSR), Instituto da Mobilidade e dos Transportes (IMT, I.P.) and Prevenção Rodoviária Portuguesa (PRP); together with foreign and international institutions like AECA-ITV, the Spanish Vehicle Inspection Association, and CITA. This Convention is the main discussion forum in Portugal about the role of the vehicle inspection centres in the reduction of fatalities, thanks to the quality of the speeches and the number and interest of attendants. After 20 years of the implementation of vehicle inspection in Portugal, this Convention has shown and demonstrated the contribution of the inspection in the road safety and in the improvement of life quality.